The light evenness and power make it the right choice on lighting backgrounds and invaluable as studio or location all purpose light. The light velvet panels are compatible with any kind of light source and their built-in and DMX digital controls lets you adapt on the fly to the changing light conditions or desired light effect. Velvet light has been designed to easily get wide light sources by mechanically and electronically linking several panels together. The master-slave function is made to control a group of VELVET panels from the one assigned as master. The slender and solid design with its modular system allow quick set up with a wide range of rigging options: ball head rapid mounts, yokes for ceiling grids installations or rigging on location, ¼-20” threads for rigging, multi-panel yokes of various sizes to mount several panels together and get big LED sources without investing on bulky fixtures. The compactness and lightness of the panels made them perfect for limited spaces, low ceilings, transportation and storage. Incredibly soft and wraparound quality light to easily get beauty interview shots and natural portraits.With VELVET LIGHT there is no need to use correction gels, replace diffusers or tubes due to the digital variation of colour temperature and light intensity.It’s incredibly soft beam is very easy to use, produces no shadows on the actor’s faces and does not disturb their eyes. The velvety quality light wraps around the objects and actors getting beauty and natural look images. The light evenness and power make it the right choice on lighting backgrounds and invaluable as studio or location all-purpose light. THE LIGHT VELVET panels are compatible with any kind of light source and their built-in and DMX digital controls lets you adapt on the fly to the changing light conditions or desired light effect. Velvet is more than tungsten and daylight in the same unit: you can precisely adjust colour temperature from 3000 to 6000K. Absolutely consistent lamp to lamp to mix as many units as you wish and get exactly the same light quality and colour reproduction. The colour temperature and light intensity levels are digitally displayed and can be precisely adjusted through shock resistant buttons. DMX remote control even without a controller! Master-slave function to link several units together and operate without a console. The Master unit will be the controller and the others will react. Bi-directional DMX RDM is the perfect solution on studio simplifying the assignment and channel addressing of every fixture. 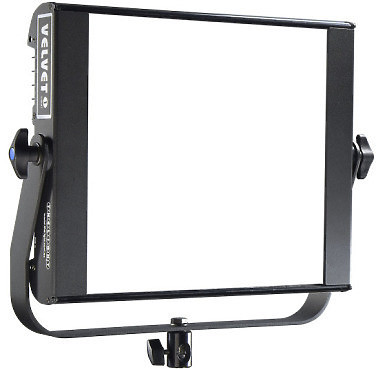 Hire the The Light Velvet-1 LED Light Panel from Procam. Best service and rental rates for the The Light Velvet-1 LED Light Panel and all cameras, lenses, sound, lighting and grip.